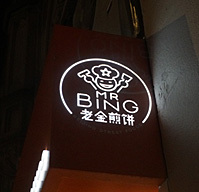 Mr Bing, a favorite of food courts, now has a brick-and-mortar location in Chelsea. Mr Bing is known for its Chinese-style crepes that come with an assortment of fillings including Peking Duck, Roast Pork, General Tso's Chicken and Kimchi. The Chelsea location is also offering several types of dumplings, rice bowls and baos.